Ok, so technically today is Day 6, but this tee was made mostly on Day 4 and finished and photographed yesterday, so we’re calling it Day 5, ok? OK! 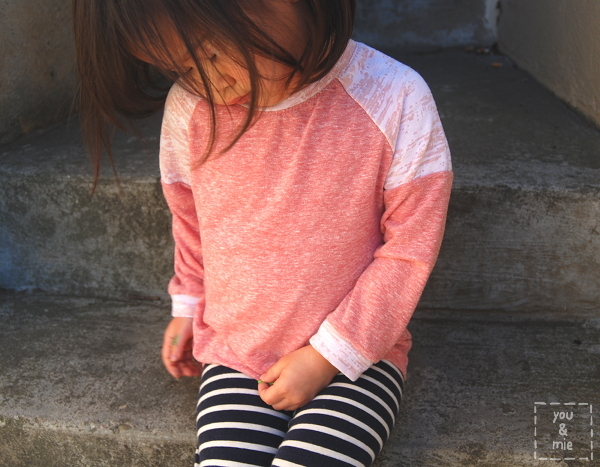 The pattern is the Oliver + S Field Trip Raglan T-shirt which is now available as an individual PDF pattern! 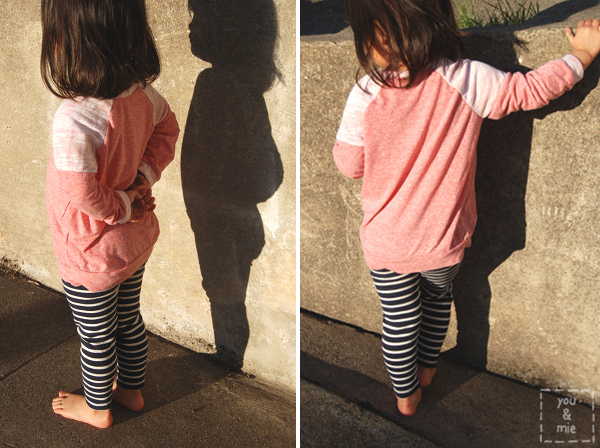 I’ve had my eye on this raglan shirt pattern for awhile, but couldn’t fork over the cash for the set, knowing I’d probably never make the cargo pants. But Oliver + S have started offering some of their basic pieces as separates! 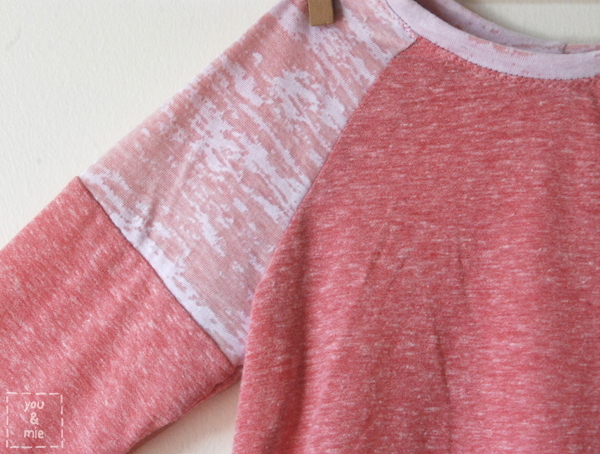 And a good raglan pattern seems like a staple for any collection. This one doesn’t disappoint and I already have several ideas for more raglans and remixes that I can’t wait to try. 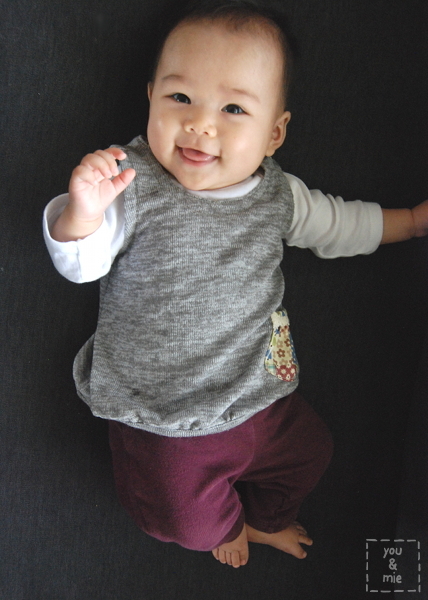 I made the shirt in size 3T and it is a little large for Yuki, which isn’t much of a surprise considering her petite size. I probably could have gone down a size, but this is great because I know it’ll fit her for awhile. It’s definitely a looser fitting shirt than the Flashback Skinny Tee, which, of course, is supposed to be a skinnier/tighter fit. I had to shorten the sleeves a bit. The biggest adjustment I made to the pattern was adding color blocking to the sleeves. It was super simple to do and I love the finished look. I also decided to finish the sleeves and bottom with bands/cuffs instead of just hemming it and omitted the pocket. 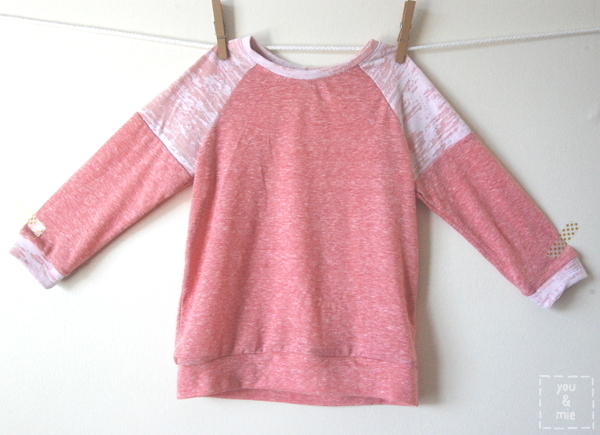 The main fabric is a suuuuper thin and soft heather red knit. It’s so heathered that it looks pink. I bought it from the remnant bin at Discount Fabrics awhile back. I picked it out because it is really soft and comfortable, but I don’t think I realized just how thin it is. 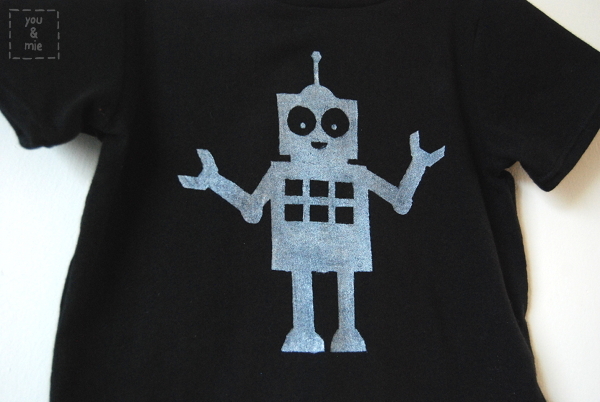 I wasn’t sure if it’d be stable enough or opaque enough for a shirt, but it worked out fine, it just isn’t very warm. But definitely soft and comfy. The color blocked shoulder, neckband and arm cuffs are actually two layers. An ever MORE suuuuuuuper thin and see through, burnout tissue knit in white on top of the heather red knit. I don’t even know why I bought this burnout knit since it’s pretty impractical on it’s own (unless you can pull off the see through top look, which unfortunately, I cannot). I actually had thrown it in my “get rid of” pile because I didn’t think I was going to use it, and then fished it out for this. Turns out, it looks great layered! You can kind of see how see through the top is here, over Yuki’s striped leggings. I knew that these knits, being as thin as they are, were going to be a bit of a challenge to sew. In fact, they were a challenge to cut! They are so stretchy that if you’re not really careful, your pieces can come out a little misshapen. I tried the stretch stitch with a ballpoint needle and my walking foot, but even with all that, the fabric was getting sucked into the machine and stretched out. I probably could have busted out the tissue paper trick and been fine, but instead I switched over to my serger and it sewed up so easily. 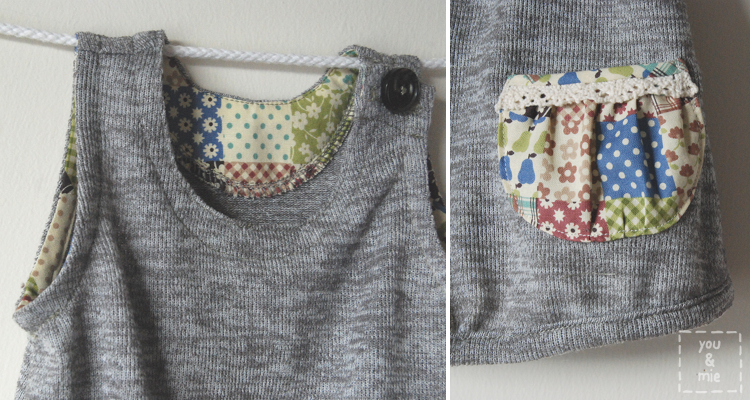 So I constructed the entire top using only my serger – this is my first time doing that – and I loved it! The only time I used my sewing machine was to topstitch the neckband down with a stretch stitch. I would have used it to hem the sleeves and bottom, but since I finished those with cuffs instead, I didn’t need it. SO EASY. Doing a color blocked shoulder panel/sleeve is a very simple pattern adjustment, but if you’re not sure how to do it, I’ll tell ya! First, I cut out my sleeve pattern in the appropriate size. Then I drew a line horizontally across the sleeve where I wanted to add the contrast fabric. My line is 1/2 an inch below the bottom of the armhole. 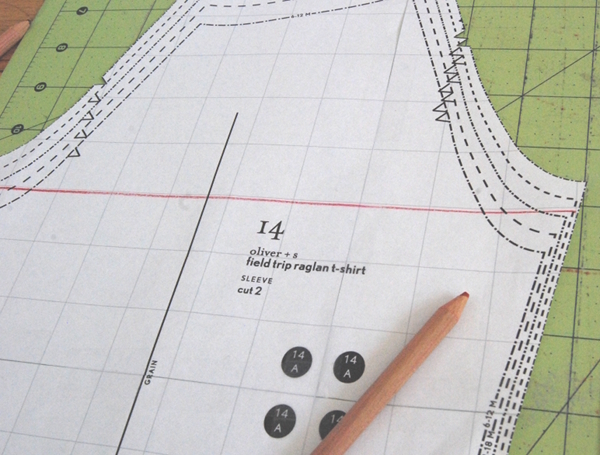 Place a piece of tracing paper on top of your sleeve pattern piece and trace the top of the pattern up to the line you created. 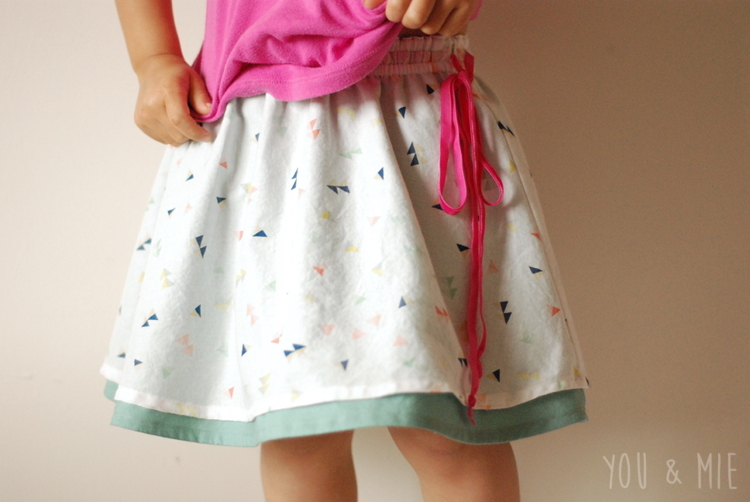 You’ll want to add a 1/4 inch for seam allowance. On a separate piece, you’ll need to do the same for the bottom part of the sleeve. Trace around the bottom of the sleeve up to the line you created and then add a 1/4 inch for seam allowance above the line. Now you have your two sleeve pieces! This Oliver + S pattern, like all Oliver + S patterns, is really well written, with clear directions and diagrams and helpful tips. I can never speak highly enough of their patterns. They are just so reliable and . . . GOOD. The shirt comes together really quickly and is a great first-knit-project, if you’re looking for something to get you started. 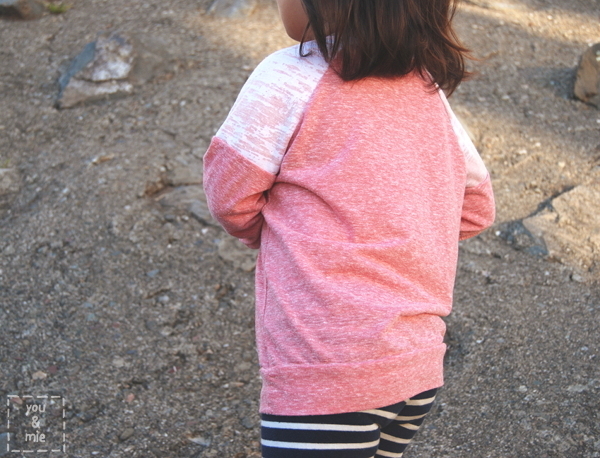 It’s a great basic for boys and girls and now that it’s offered as a separate pattern, there’s no reason NOT to get it. So that’s a wrap for my Kids Clothes Week. I made two things, this and the Knit Baby Vest. Back in the day I might have tackled 6 projects, but I’m just not that same young sprightly thing I used to be! 😛 I love both of the things I made and that makes me feel happy. How did your week go? I haven’t actually had a chance to do much browsing of other people’s projects unfortunately, but maybe that’s what I’ll do today and tomorrow. 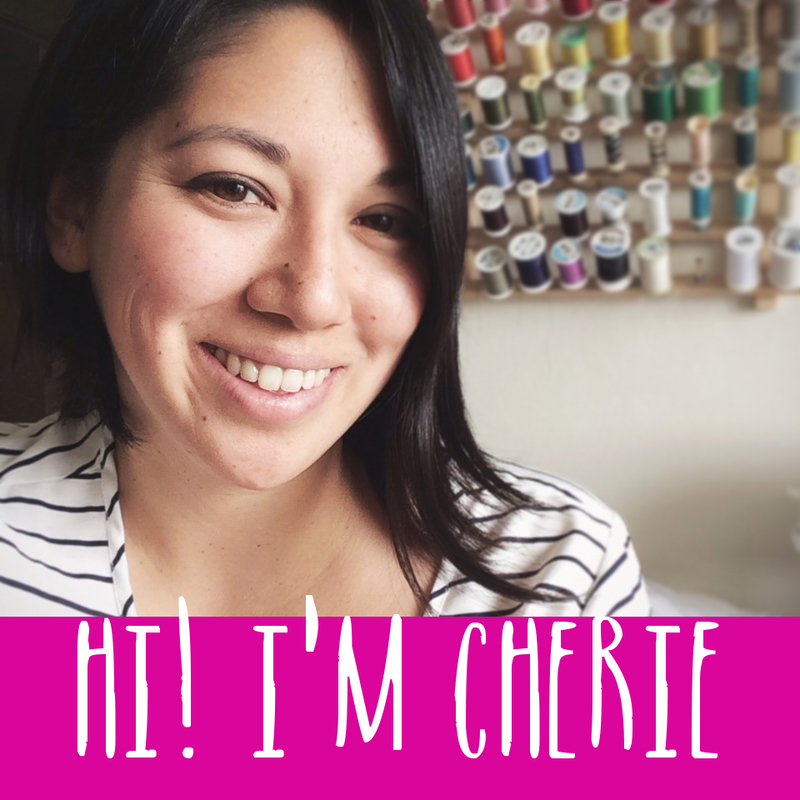 But if you sewed along, leave me a link to your favorite project from your week and I’ll be sure to check it out! Well I woke up sick yesterday and nearly threw in the towel on Kids Clothes Week, but I’m chugging along slowly just to see what I can get done. I started out with a possible 6ish projects for this week and that list has quickly dwindled to two. If I can finish two things, I’ll be psyched. Neither of my daughters really need any new clothes. 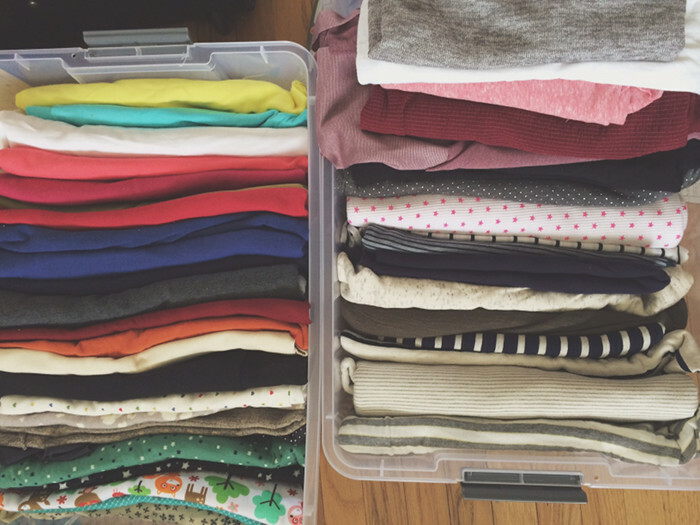 Yuki’s drawers are overflowing and Kaya’s are too, plus she grows out of everything so fast. So naturally I was drawn to the least practical thing ever. 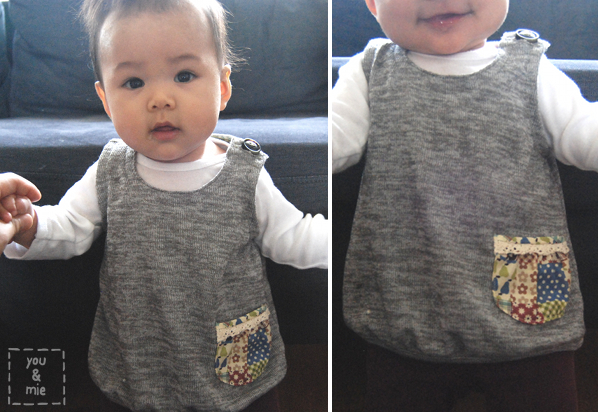 It’s the Knit Vest from a Japanese sewing book, いちばんよくわかる赤ちゃんと小さな子の服 (Easy to Understand Baby and Little Kids Clothes). You can see more pictures from the book in this post here. Frankly, I surprised myself when I picked out a project from a Japanese sewing book. I have so many that sit on my shelf, usually passed up for a more user-friendly PDF pattern in English. But it was calling to me, so I just went with it. Since my kids don’t actually NEED anything, I might as well use this as an opportunity to practice new sewing skills. 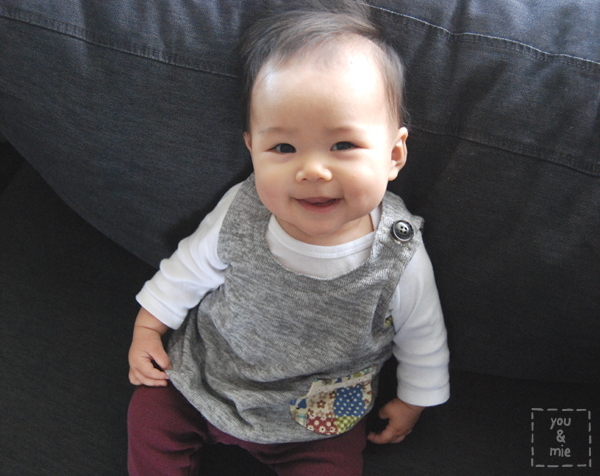 The fabric is a really loose sweater knit that I’ve had in my stash for a long time. Really soft and comfy, but very tricky to sew with. Definitely helped to use the walking foot for this one. And I couldn’t get my buttonhole foot to work on the thick layers of folded knit, so I had to do some zig zag hackery on that buttonhole. The tricky fabric made this a little difficult to sew up and honestly, it’s not my finest work (don’t look too closely at my stitches! ), but really, who is going to notice? Especially when it’s on this little one! BAM! Bet you don’t even notice the vest at all now, huh? She makes me feel all gooey. Haha. Anyways, the pattern itself was fairly straight forward and easy enough to figure out with all the great diagrams and tips I learned during the Japanese Sewing Book Series. 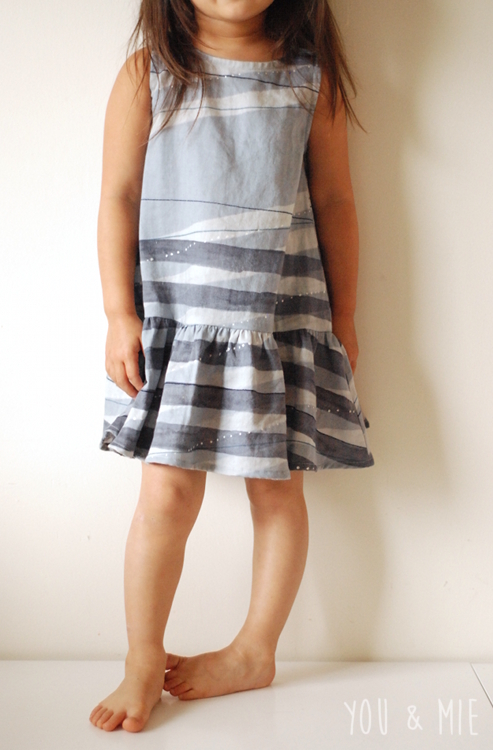 Alright, I’m off to the Kids Clothes Week site to figure out how to upload my first project! Then maybe I’ll make a shirt for my other daughter. And then sleep. So things are off to a pretty slow start over here, in terms of Kids Clothes Week. No actual sewing going on yet, but I’ve been thinking about it a lot. That counts for something right? I think I’ve finally picked out a few items I want to work on and last night I did some tracing and cutting and taping of patterns. 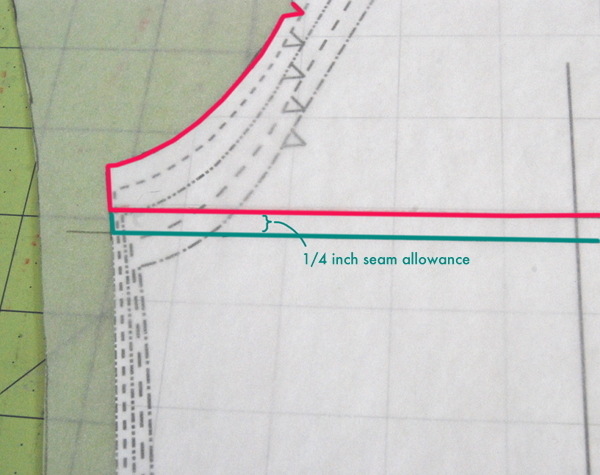 I’m even busting out a Japanese sewing book, so I’m using Meg’s awesome trick for adding seam allowance. But seriously, getting my patterns ready has taken me 2 days and I haven’t even finished yet. Oy. So tonight I’ll finish preparing the patterns, pick out some fabric and hopefully get it cut. Maybe even do a little sewing? Probably not. Most of the sewing will probably happen on days 3 & 4. And if all goes well I might even have a garment or two to show you before the week is over. I still need to figure out how to use the KCW website too. Where are you with your KCW plans? Been more productive than me, I hope? And though this isn’t really KCW related, here is my dining table today. Can’t wait to see what you’re making! Well hello! Long time, no see! I thought it was about time I check in around here – let you know that I’m still alive and well. And how are you doing?? 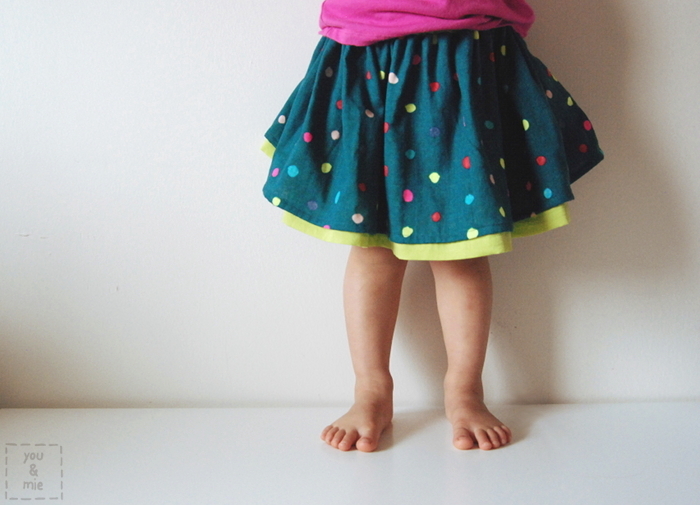 If you’re into sewing and blogging and kids clothes, (and chances are, if you’re reading my blog, you are), then you know that the first ever Kids Clothes Week: SUMMER is here and is, well . . . just about over! So where are all my KCW creations!? No where! ‘Cause there aren’t any! 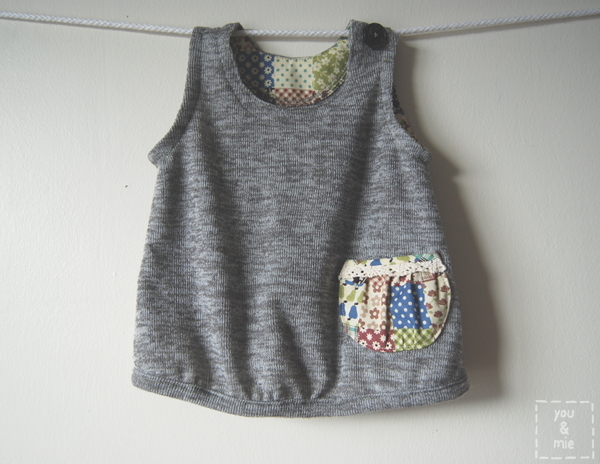 In fact, I haven’t sewn anything for my kid since this summery top back in MAY! 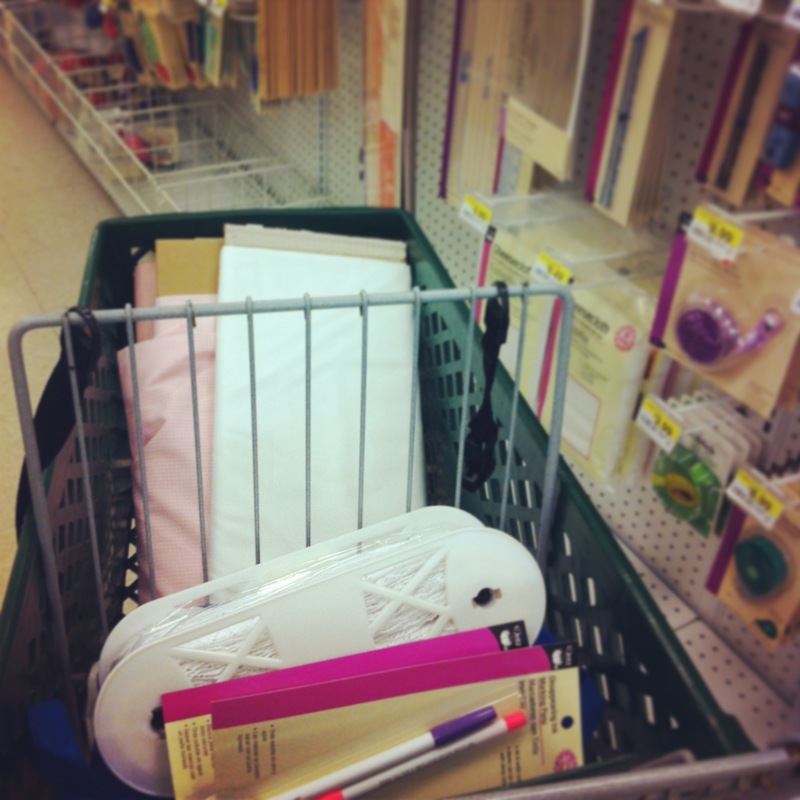 On Monday I went to JoAnn and got some supplies. 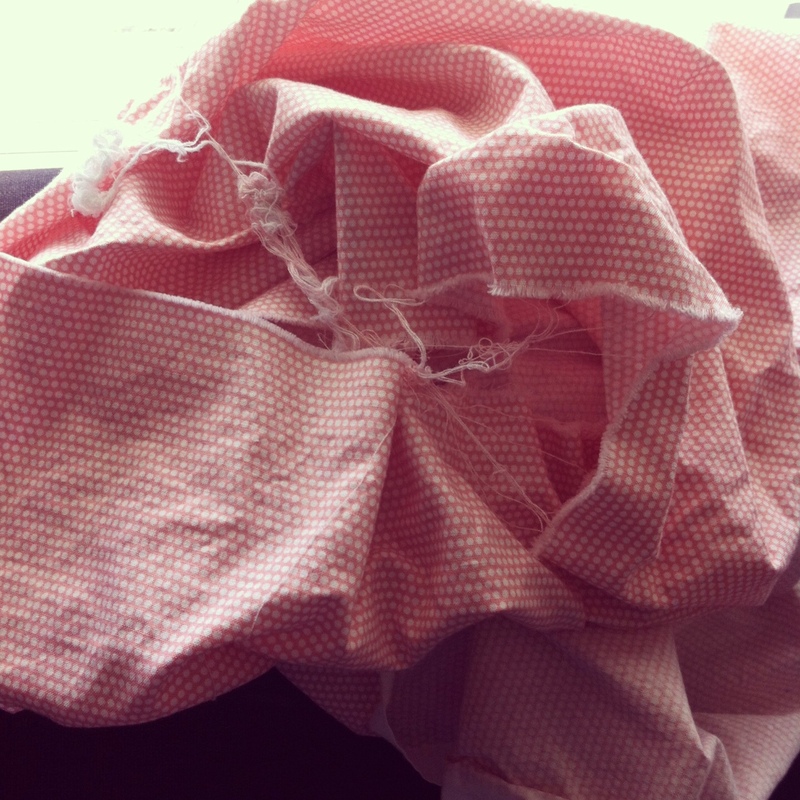 On Wednesday I washed my fabric. At some point I even managed to get it untangled and folded. 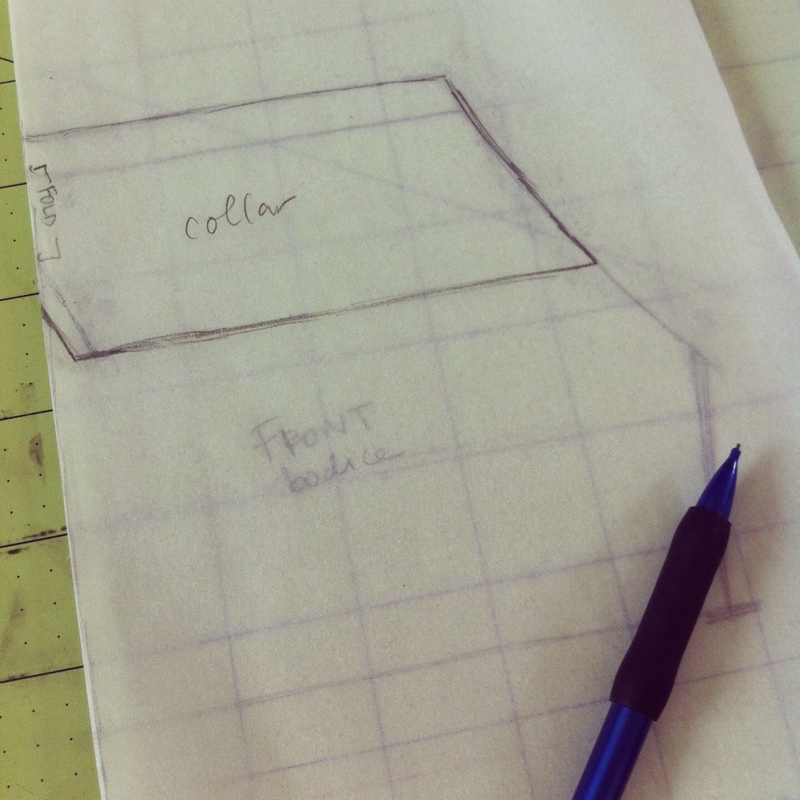 On Friday, I drafted a pattern. After I took this picture, I actually ended up scrapping it and making a new one. Since I clearly wasn’t about to finish two projects this week, I decided to save my “for fun” project for a later date and I’m working on something for a guest post. So even though I’ll finish it this weekend, I’ll have no finished projects to show you till next week. KCW fail? I think so! But that’s ok, because like I said, I’ve been busy! And taking breaks and taking it easy once in awhile is good for you! And there’s always next time, right? So what about you? Did you participate in the first Summer edition of KCW? What have you made? Do you like the new KCW website? I honestly haven’t had too much time to poke around yet, but it looks pretty nice! 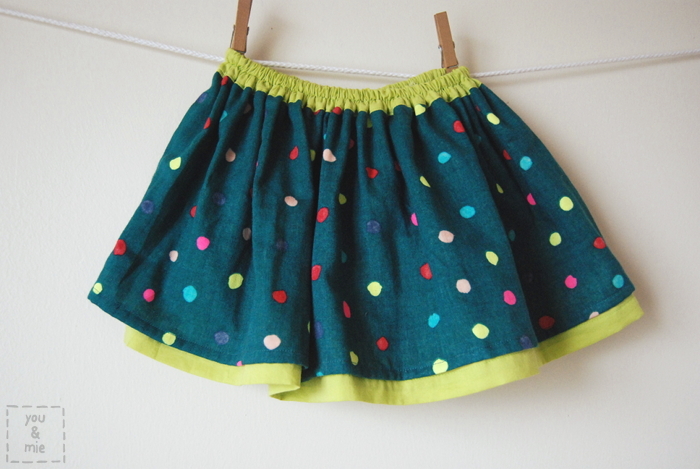 Well, I’ll be back next week with some adult sewing, kids sewing and fun news. 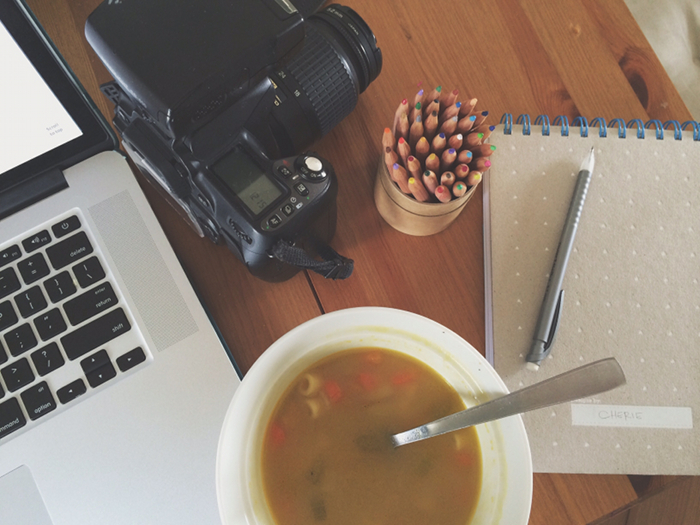 I’ve missed blogging and checking in with the rest of blogland, but it’s summer and things always slow down for me around this time, which is great. I’ve been able to relax a bit and enjoy time with my family. I hope you’re doing well too! So this was actually part of my Kids Clothes Week project list, but I didn’t quite finish it that week. I did finish the “All My Friends Are Dead” shirt and Yuki liked it so much that I was excited to get these done as well. 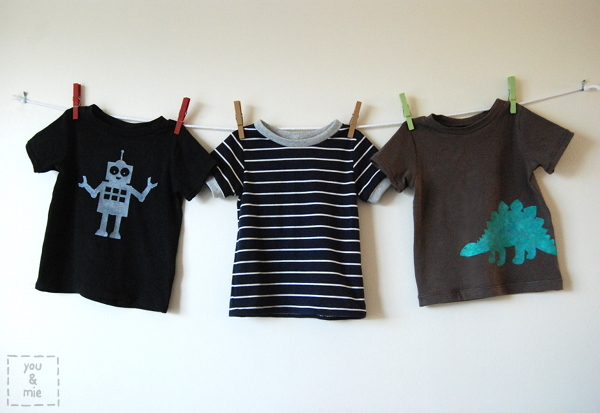 If you recall, she requested a dinosaur shirt, a robot shirt and a shirt with stripes. So there you have it! Three more t-shirts for my tomboy. I didn’t actually intend for them to be so boyish. I did make a bright pink one first but the rest of the knit that I had laying around happened to be dark. 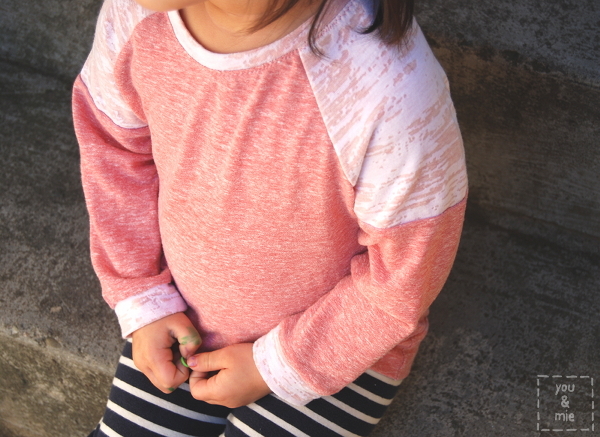 The pattern is the Flashback Skinny Tee by Made by Rae in size 3T. 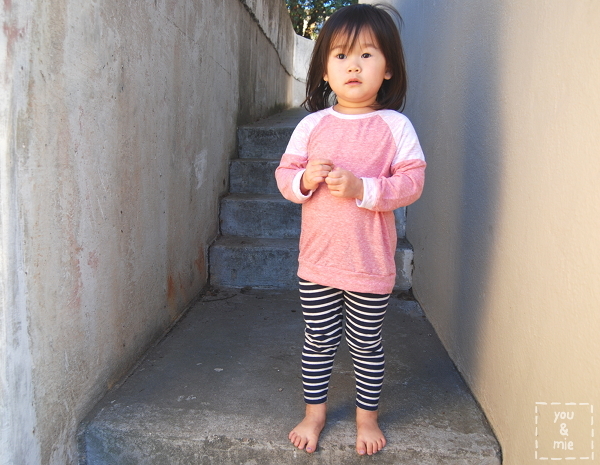 My daughter is more like a 2T, but since I wanted it to fit a little looser and fit for a long time, I went a size up. I would recommend doing the same if you want a less “skinny” fit. 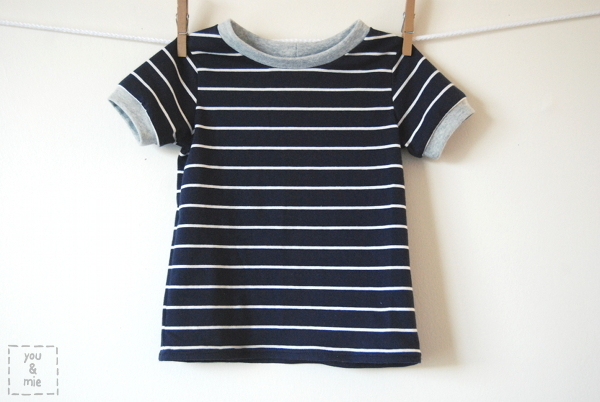 The first one is a simple tee with contrasting arm cuffs and neckband. This was the easiest one to make not only because I didn’t paint anything on it, but also because adding cuffs is way easier than hemming sleeves (in my opinion). 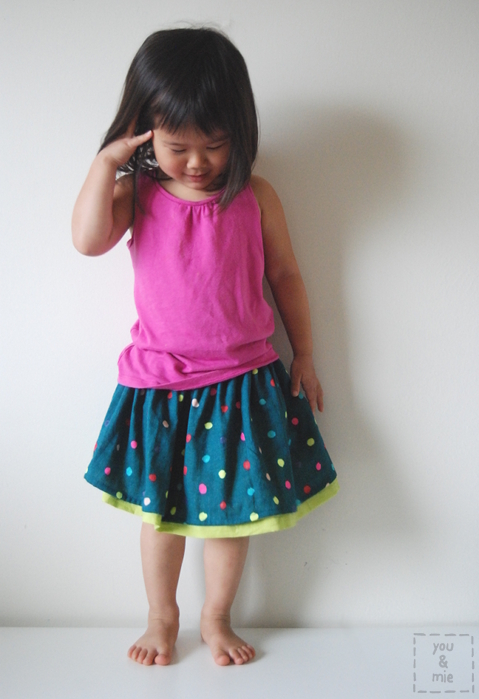 Rae has a tutorial for making a short sleeved FBST here. 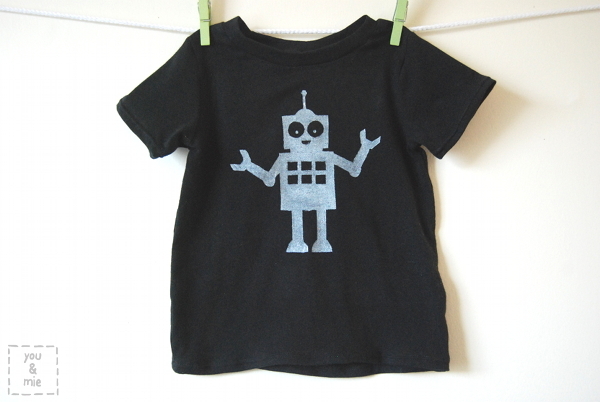 The second tee is the robot tee! Simple solid black knit with hemmed sleeves. I just used the same fabric for finishing the neck. 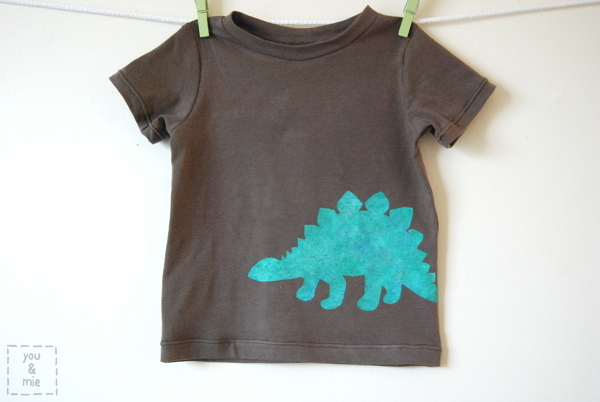 For both this tee and the Stegosaurus tee, I just searched for simple images/silhouettes on google image to use as a stencil. I printed them out at the size I wanted, cut it out to use as a stencil, traced it out on contact paper and cut the shapes out. I know everyone talks so much about freezer paper stencils, but honestly, I have no idea what freezer paper is! I really need to find out though, because contact paper does not work all that well. 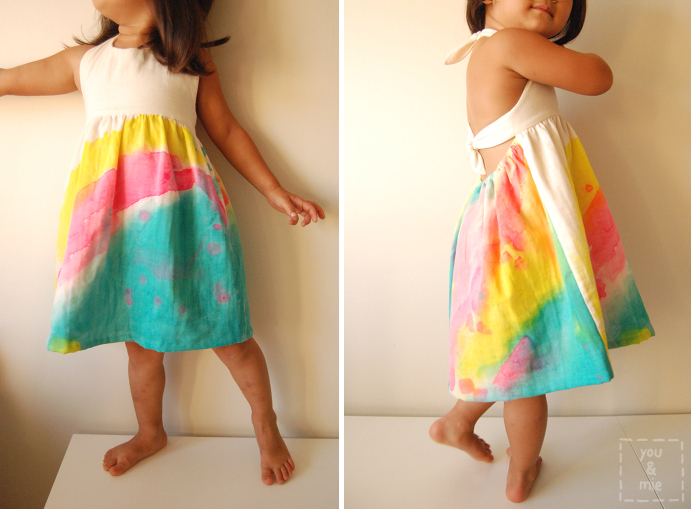 It doesn’t stick to the fabric as well as I’d like, so it leads to wobbly lines and such, if you’re not careful. This is honestly my favorite too. It’s made from a super thin, soft and comfy knit. 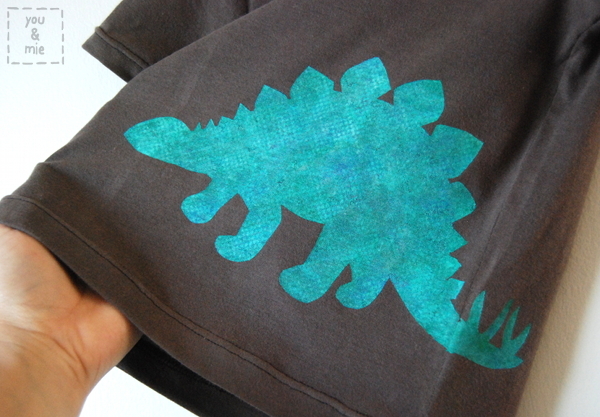 The stegosaurus wraps around the side slightly and I just used a bunch of different fabric paints in blue, green, silver and white to give it the multicolored look that it has. At the last minute, I decided to take a quilted paper towel and lay it over the painted area. I pressed it down on the paint to pick up any excess and when I lifted it, it gave it this really cool textured look. Like a real dinosaur! BUT I LOVE THIS PATTERN. So basic. So quick. So many ways you can mix it up. As of now, I’ve used this pattern at least 6 times and that’s more than any other pattern I own. 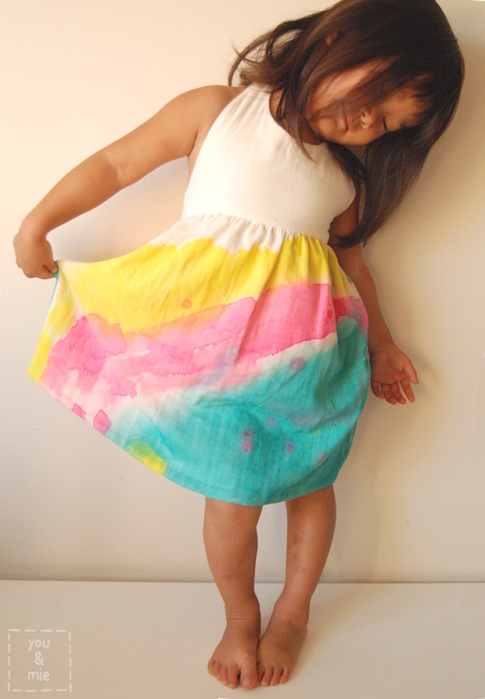 It comes in two size ranges: 12-18 months-5T and for bigger kids, sizes 5/6-13/14! If you don’t own this pattern yet, I think you should go get it now. AND ALSO . 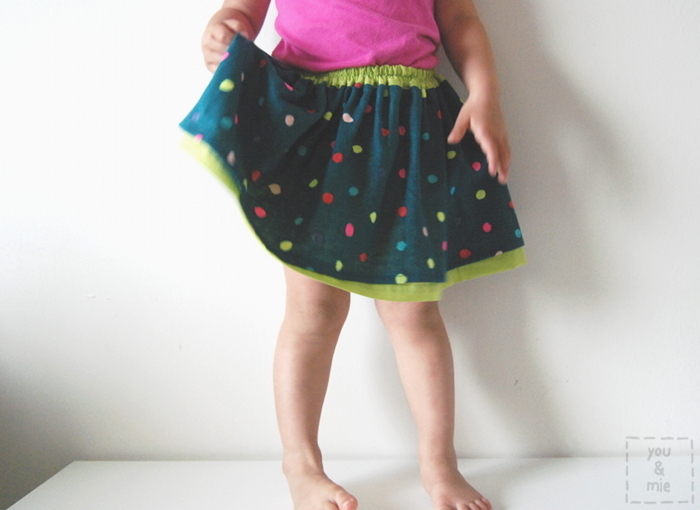 . . I’m trying to sew more for ME! So if any of it comes out decent and I work up the courage to model them, you may get to see some of it 🙂 We’ll see! 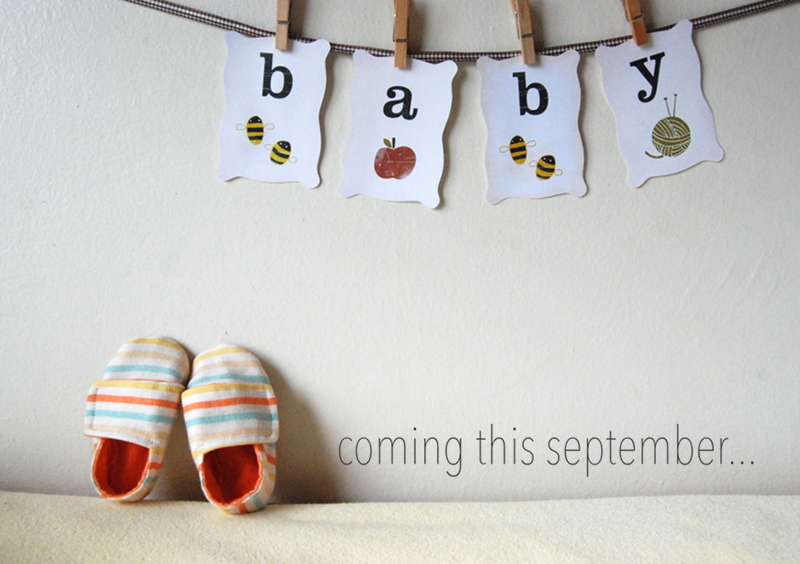 One last project, for a little someone . . .